I’m back again today with another installment of the popular “Timelessly Representing” series, and today we begin our look at the major NCAA Football conferences. We’ve now tackled MLB, the NFL, the NBA, the CFL, and the NHL — if you’d like to check those out, here are NBA, Part I; NBA, Part II NFL, NFC Edition; NFL AFC Edition; MLB, National League Edition; MLB, American League Edition, the CFL, NHL, Part I and NHL, Part II. I’m pleased now to bring you UW reader Christopher Hall, who, like several others, compiled this list during the summer — I had hoped to get to these during Paul’s blog-cation, but I was just overwhelmed with reader suggestions for articles. Now that it’s deep in the heart of football season, I’ll run the NCAA Timelessly series. Ready? We start with the B1G today. Hey Phil. First off, thank you for the chance to put this list together. As a Michigan fan, it was a chance to learn a lot about the histories of the B1G’s other teams and stadiums. With that, I realize that I’m no expert as to any other teams’ iconic looks and designs over the years. If you disagree about any of the iconic looks I’ve listed, please let me know, if only to better my favorite teams in the NCAA. Thanks again and have fun reading! Thanks, Christopher. Nice job with that! Obviously, most of this is opinion, but I would say you’ve done a pretty nice job in that regard. Lots of tradition (well, maybe not so much anymore) so many unis from several eras could probably all qualify, and of course, it being college, not too many stadia from which to choose. In case you missed it, Paul’s latest ESPN column, his Uni Watch 2013-14 NHL Preview, is now out for your viewing pleasure. Highly recommended if you didn’t yet see it! My subtle alteration to the Washington Nationals uniform is inspired by uniforms worn by soliders during the American Revolution. Basically, it’s a combination of their blue and red alternate jerseys. Brought back the “DC” logo because I like it and it’s been my high school’s logo for decades. And added the white stripe to the pants. Thought about changing the colors of the belt and socks. Here is the inspiration for my uniform concept. Like I said this was a subtle change, but I spent more time on than I should have trying to make it look as best as possible to present to you and the folks at uni-watch. Although I enjoy imagining, designing and altering uniforms/jerseys/kits, I lack the ability to make my “projects” look nearly as good as I imagine them. It can be frustrating because I believe I have a lot of great ideas but I’m unable to do my visions justice. Also, I’m not sure it helps I use GIMP. Since I do this for fun photoshop isn’t worth it so I’ve made do. I welcome any tips, suggestions and/or criticism. If y’all like my idea, I’d be glad to share others with the folks at uni-watch. Let me know if this is the best way to share them or if y’all prefer folks share ideas another way. Hope you enjoy and I look forward to a reply. Have a great weekend. I saw someone had an “American” logo submission for today’s UniWatch blogpost so I decided to send you guys one of my own. Shows what they would look like with the team color swaps like some conference like the SunBelt and C USA do. Here’s a couple of concepts for the New Orleans Pelicans that I made. These are infinitely better than the one I submitted 6 months ago (scroll down), which happened to be my first uniform design ever. The “New Orleans” wordmark is apparently what will be on the actual uniforms. The “Pelicans” wordmark on the first alternate comes from the floor design. I originally made the first three uniforms but decided to get a little creative with the Crescent City Basketball logo, which I love. The inspiration for the second uniform set came from the Golden State Warriors uniform set and San Antonio Spurs alternate uniform. The number font and player name font is from the Texas Rangers. I decided not to include a stripe down the side to give them a more classic look. The main differences between the two (besides the huge logo on the front) are the change in the logos above the player name and the on the shorts; the numbers changing from a two color scheme to a three color scheme; and the tramp stamp (I did it just for Paul) changes from “Pelicans” to “New Orleans” only on the first alternate. Here’s a link to hi res images of the uniforms. OK, readers — you know the drill (and if you don’t it’s quite simple) — you simply need to figure out what game is being played using the clues found on the scoreboard. This one should be VERY easy, based on the visual clues. The UWFFL is back this week and here’s a few interesting story-lines to follow. With the NFL’s new guidelines on multiple helmets in place, three UWFFL teams, Tampa (pictured left, decked out in creamsicle orange), Atlanta and Seattle are wearing the throwback colors that their NFL counterparts can’t, the Brooklyn Mariners (pictured center) are wearing a special tribute uniform in honor of a military hero, and our latest expansion team, the Albuquerque Red Skins (pictured right) make their UWFFL debut with a team nickname that is currently at the center of a lot of controversy and hope that things don’t break bad for them. Read all the details and be sure to vote to help us choose this week’s winners at www.uwfantasyfootballleague.com. Uni Watch News Ticker: The Newtown High football team remembered Sandy Hook with special jerseys (This happened last week, but Dane Drutis just saw it yesterday). … In the video posted on deadspin.com from MLB.com showing Mariano Rivera making his way out of the game on Thursday, Mark Teixeira is in the dugout in a 2011 Yankees Playoffs sweatshirt (good spot by Chad Stegemiller and also by Brett Crane). … Thursday night, Portland State wore some kind of camo pattern vs. Cal Poly. … App State will be wearing gray uniforms today (first time ever) versus Charleston Southern. … “According to Sam Presti, GM of the Thunder, the team will likely wear a sleeved jersey at least once this year,” writes Brittany Novotny. “He had no specifics as to which game it will be. He also indicated they will continue to use the navy blue alternates this year. See about the 22:00 mark in this video of his press conference.” … Is there a 2012-13 Stanley Cup Engraving Error? 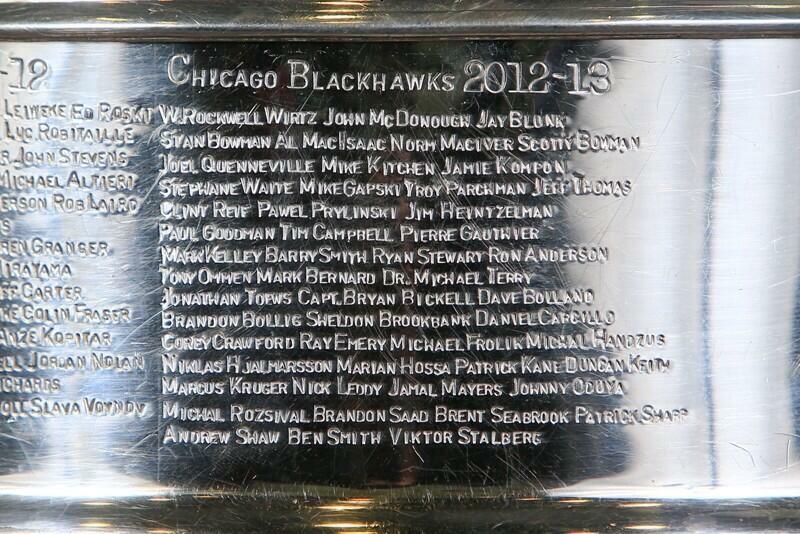 Michael Kramer thinks the engraver got the B in “Blackhawks” upside-down this year. 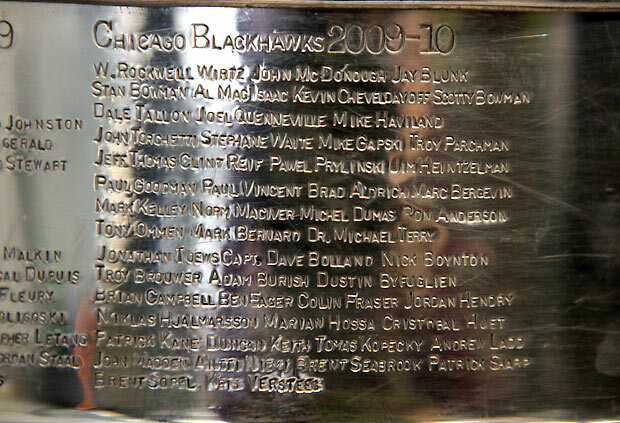 “Look at the Cup’s new engraving and that from the Hawks’ last go-around. The error isn’t a misspelling like last time (note the clearly altered “Versteeg” on the ’09-’10 version); it’s much more subtle.” … Reprinted from yesterday’s comments: “Check out this rugby clip,” says Jason Bernard. “Do rugby teams not have change strips? Can you believe the hot pink ref?” … “Do we really need UA-logo’d onesies?” asks Gretchen Mittelstaedt who received an E-mail with the subject line, UA For Your Littlest Athlete.” … Patrick McQuillen cannot remember the last time Tyler Myers had the NHL logo on the collar of his jersey. Even in public appearances the logo is missing. “Also, do NHL players wear their official game jerseys for appearances,” asks Patrick. “The Buffalo Bills appear to wear replicas.” … The Warriors’ Stephen Curry has left Nike and gone to UA (thanks, Brinke). … Nike and the Portsmouth schools have reached an apparel deal that is described as “a ‘win-win’ because while student-athletes can wear a Nike product, the agreement gives the school district ‘the opportunity for affordability and purchasing a mass product at a low rate’,” (this depressing news comes from Tommy Turner). … They still play football at old City Stadium, where the Packers played from 1925 to 1956. It’s the home field for Green Bay East High School. When Ashwaubenon High School’s JV team played the East JVs there Monday, its coaches went old school. Shirts, ties and even a fedora (thanks to Jeff Ash). Also from Jeff, The Green Bay Packers will help out Concordia College (Alabama) after that tragic bus fire a few days ago – the Pack will be donating gently used game pants and socks. … The Washington Huskies will be wearing their shiny new gold helmets today against Arizona (h/t to Jimmy Wong). … LSU will honor their late coach, Paul Dietzel, with a “PD” decal on their helmets (thanks to Daniel Fontenot and Trey LaBorde). … Orioles rookie Jonathan Schoop has been batting sans gloves since he’s been called up (good spot by Bryan Duklewski). … Reprinted from yesterday’s comments (Tom Mulgrew): Here’s Yasiel Puig dressed as Gumby (part of the annual MLB rookie hazing ritual). … Aaron Scher saw this display in a McDonald’s a few days ago. He’s not sure why they chose to use a photo of Cruz in a Pro Bowl jersey, especially with the other two in their normal attire (and why is his helmet missing the red stripe?). … Yesterday, Boston College took the (now no longer unique) step of tweeting out pieces of their new basketball uniforms. … The Golden State Warriors will have a alternate white sleeved jersey for 2013-14 (thanks to Mike Rowinski). According to this article, they’ll wear it “for every Saturday home game during the 2013-14 season, beginning Saturday, November 2, 2013.” Here’s another look. … Check out your Utica Comets in on-ice action! (h/t Harry Michelson). … Hmmmm – I tweeted about this the other day, and now it’s happened – Cam Newton’s UA Visor Clips will cost him $10,000 (h/t Josh Petty). … Check out the Ohio University Football team in 1903. Says submitter Jonathan Daniel, “Looks like at least four different kinds of uniforms and four of the guys have some kind of (I’m assuming) face guard dangling from their necks.” … Seems as though the Washington Wizards have a new-ish look (h/t “MH”). … Tweeter Jason Bray “found this bottle today for the 1976 orange bowl. Did OU use this logo?” Anyone know? 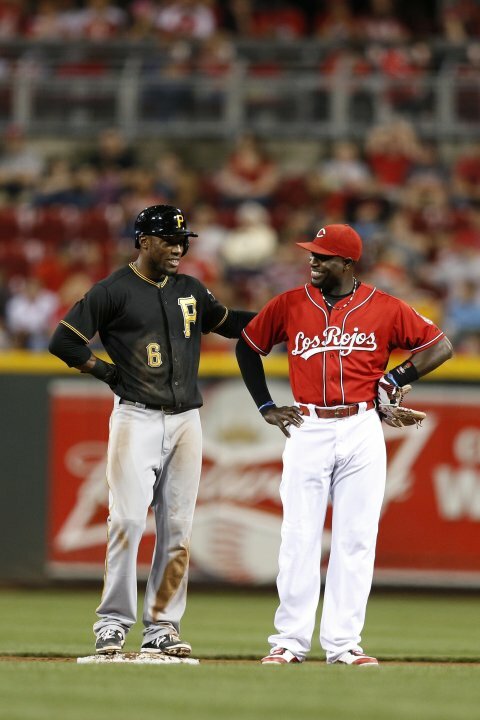 … Last evening, the Reds wore their Los Rojos jerseys (thanks to Patrick O’Neill), in celebration of Hispanic Heritage Month (see notes). In Case You Missed It … Paul’s Annual NHL Preview is now on ESPN. That’s going to do it for this fine last Saturday in September. Big thanks to Christopher Hall for the “Timelessly” effort on the B1G, and to the concepters & Rob — don’t forget to visit the UWFFL blog to check out this weekend’s matchups and to vote on your winners. Lotsa uni-shenanigans going on this weekend for the colleges, so I’ll expect that tomorrow’s SMUW and 5 & 1 will be huge! And the Ducks are back in action tonight (late) taking on a gray-jersey’ed Cal team (hope the boys from Eugene take that into consideration) so we’ll have a Duck Tracker tomorrow as well. Everyone have a great Saturday, and I’ll be back with Terry, Catherine and Tim with a full Sunday Morning Uni Watch tomorrow. If you’re going to refer to Northwestern’s football field — especially if you’re talking the 70s — call it by its proper name: Dyche Stadium. And it looked like the Bears were playing there in the photo. Both the NFL (when the goalposts were on the goal line) and the college goalposts were up. Also, it’s Ryan Field or Dyche Stadium, not Ryan Stadium. Your pick for Ohio State is spot on. The sleeve stripes on the ’73 jersey, both home and away were the best. They need to return. Illiois: the 1979-1987 uniforms and helmets. 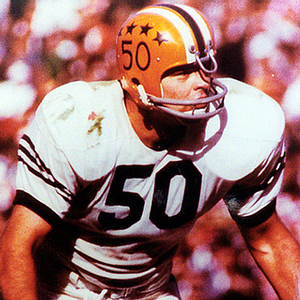 The helmet facemask color went from blue, to gray to orange. I prefer the blue. Michigan State: 1978-1982. Jerseys and pants were close to the same as what you picked, but I prefer the Spartan on the helmet. Bring back the gray sleeve stripes Ohio State. Based on their infrequent success the last 30+ years, i’d say the Indiana uniform should be from the Bill Mallory – Anthony Thompson late 1980s era. Nope. No black should appear on an all time best Indiana Uni. Purdon’t do it. Don’t act like you broke the Cam Newton visor story. You merely tweeted a link to the PFT article. I usually avoid the weekends on this site because I find you over bearing and a Paul wannabe. I have been a long time reader and early member of this site. My first weekend back in a long time will be my last until you are replaced, take care. Anyone else wonder about the Utica Comets moniker, given that the Fort Wayne Komets have been around for longer than my lifetime, aren’t affiliated to the same NHL team, and have survived the demise of a few leagues? …ugh copyedit. I meant “Saskatchewan’s all-white look is just a little cleaning up away from being great”. The Utica Comets took their name from the Clinton Comets. See the “Coast to Coast” section of this article on the history of the name (and why it is completely inappropriate). I agree. The current uniforms are rather nice, but they just haven’t existed long enough to be “timeless”. If the team remains half-decent and is still wearing them in 2020, then we can talk. 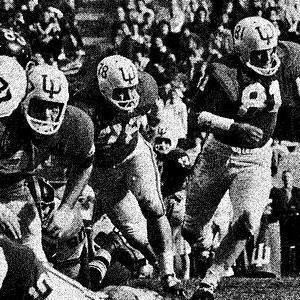 Only bowl win since ’49 came in these unis… #InstantClassic? Definitely agree. The 1995 look remains the classic for me and a lot of my friends. We’re still hoping that NU switches the current set to black over purple. It was a really huge deal to go to that Rose Bowl, even if they got trounced. The Rose Bowl was actually a pretty close game that was undecided in the fourth quarter. It was hardly a “trouncing.” Plus, USC got a gift TD on a fumble return, a call that would have been overturned by reply today. There is a black alternate home jersey that will probably make an appearance again (next week vs Ohio State?). Go ‘Cats. Yeah, but I think he means as the regular home jersey, which is something I’d tend to agree with. Purple black Purple > purple purple black. 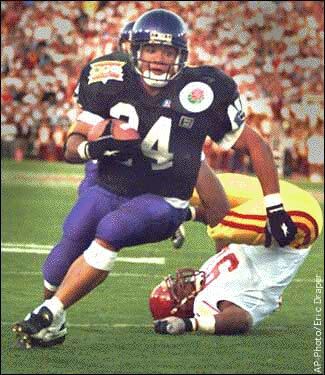 Agree – the 1995/1996 uniforms — the only Northwestern look that could be considered “timelessly representing.” I love the current uniforms, but the Rose Bowl team (our second appearance) has a special place in our hearts. Obviously there are a variety of easy ways to solve this scoreboard. I simply looked for one of the first few games that Jean Segura was with the Brewers, and found which one Randy Wolf started. With Segura shown with a .000 batting average, this game was obviously early in his major league career. In this game, Segura recorded his first major league hit. It was an infield single off Latos in the bottom of the 5th. was there ever even a mention of Tulsa wearing their “Gold” chrome helmets on Thursday night? not a Tulsa fan by any means, but the Washington post reminded me of it. Gophers are definitely not the Metrodome. Not only was it a terrible place to play and watch, the product on the field was hardly worth watching for most of it. Old Memorial Stadium would be the better answer. Agreed. I’ll remember the Dome days for middling teams in front of a sea of empty royal blue seats in games played a mile or two from campus. Memorial Stadium was the home of NCAA championships and frequent trips to the Rose Bowl. For Nebraska, that uniform is not 1995. 1995 was the first year they dropped the 2 stripes on the pants. They wore 2 pants stripes from 1968-94 and from 04-present, but not 95. I noticed the same thing. I like that as their uniform, but the photo is actually from the 1993 season. 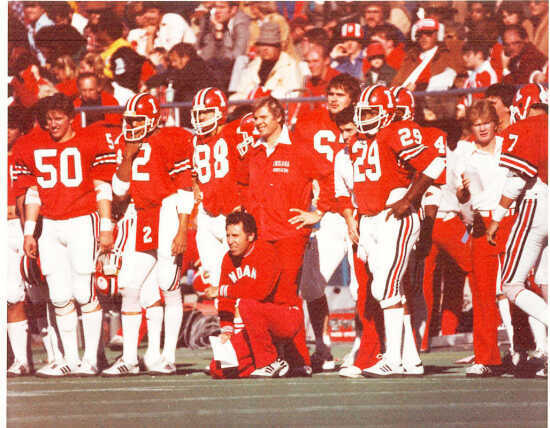 I also liked the solid red pants with white away jerseys that they did in 1995, but not as much. The two stripes still look better. 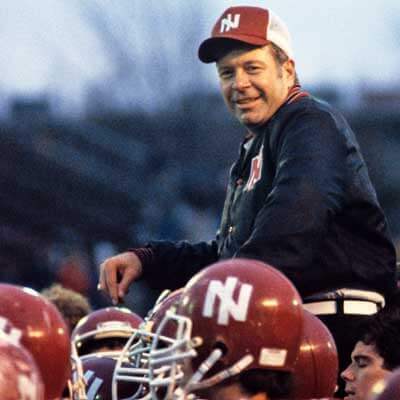 1995 is also the year that Nebraska began wearing adidas equipment, so of course that’s when they began tinkering with the pants stripe! I just going to type the same thing, but you beat me to it. I nearly cried when the Cornhuskers removed the stripes from the pants following the 1994 National Championship season. The stripe-free, shiny pants were hideous. The guess the game is August 8, 2012. I started by looking at the line-ups. Jean Segura was a rookie this year who was in the bigs for a little bit last year so that narrowed it down to this season and last. Wilson Valdez, however, is not on the Reds this year, so I knew this had to be last year. Then I went to the baseball-reference page for the 2012 Reds and scrolled through their games looking for games they played @ Milwaukee, eliminating the games where a starting pitcher who wasn’t Latos for the Reds or Wolf for the Brewers got the decision. It took a few extra seconds because neither starter got a decision in this game, but once I recognized the winner and loser of this one were relievers I knew this was probably the game I was looking for. From there I just looked at the line-ups, and that the first couple innings of the line score looked right and realized that this was it. Went to Latos’ bbref page…2012 game logs…sorted vs teams he pitched against…only 1 game at Milwaukee…8/8/2012. Is it just me, or does that American Athletic Conf logo look a lot like the D-baags? Thanks for the comments guys. I had fun putting this together and researching teams’ history, and I knew there were going to be mistakes that I’d overlook. DJ, I’m 17 years old, so, for me, Northwestern’s stadium has always been Ryan Field (I think the name change was in 1997?). My bad also on the Nebraska era. That was simply an oversight on my part. Oklahoma State wearing white Pistol Pete helmets today. For the UWFFL, the San Antonio-Goldsmith Gulch matchup has really nice contrast going on. More teams in football *cough*NFL*cough* should wear more yellow *cough*Rams*cough*. Annd as of right now, the NY Sharks-Tampa Terror matchup not only looks great, but is dead even. If only the 1983 repus bowl between the Bucs and Oilers could have gone color vs color it would’ve looked sorta like this. Yeah, it’s a shame the NFL doesn’t seem to realize how awesome color vs color games can look. The MLB took it a step too far today, as both the Angels and Rangers wore red. What is this Spring Training? I don’t think same color-vs-same color is good at all, in any sport. Also, if you’re behind with uni-tweaks, Phil, you can always just bomb us one weekend with like 30 of them as your lede. I don’t know how efficient doing two or three per weekend is gonna help if people send like 30 per day. Well the better question is how many uni-tweaks do you average per week? It’s actually really slowed down — it always does in the summer, so while I’m “behind” date wise, it will get caught up fairly quickly. The picks for Minnesota are all wrong. The main uni is ok, but the tiny M on the helmet just looks terrible. And the stadium? I went to the U, and had season tickets at the dome, and the most memorable thing was the overall terrible product-the teams, the stadium, the fans. Should absolutely be either Memorial or the Bank. The uniforms of the Chip Lohmiller era are how I’ll always picture the Gophers. If your era is remember or defined by who the placekicker was, that’s not a good sign. To me this era reminds me of the Minnesota State Screaming Eagles coached by Hayden Fox. As a Gopher fan, I strongly agree. My biggest Metrodome Gopher memories are of their numerous epic 4th quarter collapses. Also consider there was sentiment to move the team back to Memorial Stadium after a couple or so years in the Dome and the utter lack of fan atmosphere in the off-campus Metrodome…and there was a strong desire to recreate something of the Memorial Stadium vibe in the latter years of the Dome (which ultimately resulted in TCF Bank Stadium). As for uniforms? Personally, their late-1980s/early-2000s look (both quite similar to each other) has always been my fave due to its simplicity. However, a definitive Gopher image? Something from their ’30s/’early-’40s national championships? 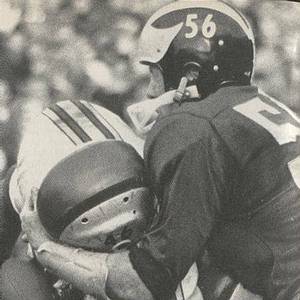 Maybe the white helmets and shoulder hoops from the 1960 national champions? Angels and Rangers playing red vs. red. Why isn’t there a rule against this? I’m not opposed to “softball tops” but this looks terrible when the only difference is grey vs. white pants. They look like a pair of slo-pitch softball teams playing in an interleague tournament. You reap what you sow when you don’t oppose softball tops. Maybe they used the Cruz Pro Bowl pick because the artwork was done midsummer when Cruz was still holding out & had not signed his franchise offer. The ad agency may have used a generic uniform on the off chance that Cruz would traded. Wasn’t that in-store ad in the ticker about a week ago? I’m wondering if this McD’s is in New York. I think the Giants have a deal with Dunkin’ in New York, so McDonalds might be barred from using a Giant’s uniform in New York area ads. I’ve noticed it at McDonald’s locations outside the New York area. Christopher, your Michigan fan credentials are in question when your chosen picture for Michigan Stadium is from the dreaded 2 year Halo era of the late ’90s. The Halo was almost as bad the the bumble bee uniforms they wore against Michigan State in 2011. The Halo was bright, gaudy, and corny. I actually didn’t mind it that much, but it looked all wrong for what is otherwise an understated, brick-heavy building. For most fans it is the antithesis of the timeless Michigan Stadium look. Pretty good job on most stuff. You’ve already seen what people think about Northwestern, which I agree with, but most of your picks are as right-on as they should be. While I like the interlocking “DC” logo better than the curly “W”, I don’t like them together in the same uniform. I like the different colored placket on white or gray jerseys moreso than what was done here, but I give credit for the look he was going for. I like the ticker that is separated by sport better. After having them separated through the week, the weekend entries look haphazard and lazy. I like them divided by sport, as well. Matthew Blinco designed a nice logo for the American conference. My only quibble is if the current logo resembles the Arizona Wildcats logo, Blinco turned it into the Arizona Diamondbacks. I still like it though. Nice concept of the Washington DC MLB team by Joshua! That set would look much better than their “flag desecration” get-ups. Aug. 8, 2012. Actually pretty easy. The low numbers under “2012 in August” on the lower right of the scoreboard narrowed it down, so I went on Baseball Refererence and found a series early in the month when the Reds played the Brewers, then down to the game when Latos started against Wolf: Aug. 8. I have to agree with the other Minnesota fans, this guy has to be trolling us with the Metrodome pick, right? Over Memorial Stadium and TCF Bank Stadium? You’ve got to be kidding me. It’d be like choosing Rich Rodriguez over Bo Schembechler and Brady Hoke. THE METRODOME?!?!? Leave it to a freakin’ Badger. Ohio State wearing hideous alternates tonight! Just one thing about the Big Ten timelessly representing. As a huge Nebraska fan, I do love the white over red but Nebraska should’ve been the red jerseys with the white pants and red stripes. That has been, and always will be, Nebraska! Why no away uniforms on this list? If you’re going to do it, do it right. And for God’s sake, never pick a picture of Michigan Stadium with the halo. Joshua Balsley, I like your Washington Nationals uniform design. I would like the team use blue as alternative color in the future. I don’t think that you lack the ability to make your “projects” look nearly as good you would like to imagine them. It is not easy to do what you are doing. I am pretty sure the American Conference teams actually already use the team colored logos on their unis. 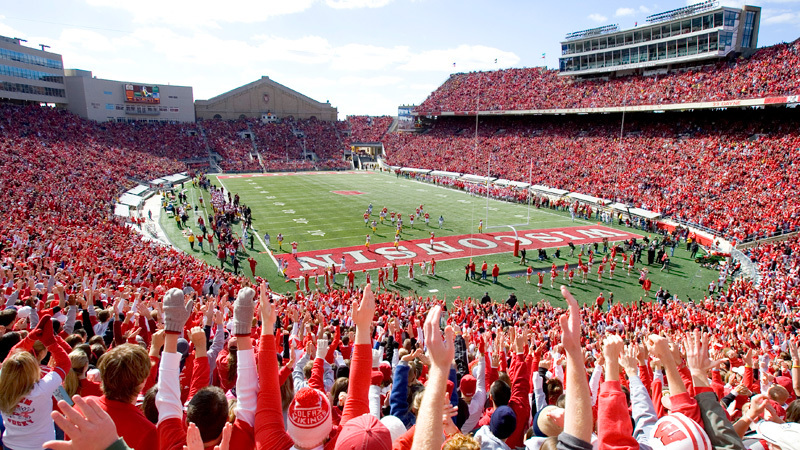 Wisconsin’s version of Camp Randall Stadium should be its mid- to late-1990s look, with the Fieldhouse looming over the south end zone and holding the main scoreboard. That configuration saw the Barry Alvarez renaissance of UW football, Ron Dayne and three Rose Bowl champions. Suprised we haven’t seen a redesign the London Monarchs, considering the London NFL news that has been swirling the last week or so.